Some twits and a press release this week claimed Jared Taylor’s lawyers had “won the first round” against Twitter. Reading the court transcript there are a few more realistic things to say about it. First, hearings like this are by design biased in the plaintiff’s favor. Twitter doesn’t want to go to trial, so they’re trying to convince the judge that Taylor’s claims are baseless. The judge argued in this instance almost as if he were an advocate for Taylor. He favors a trial, but intimated several times that his attitude during a trial would be different. this is a suit about these two plaintiffs with an enormous public stake in this case; they say that their whole enterprise of spewing… white — you know, white racism to the world depends on Twitter; that they built their enterprise around this. And that was not a promise that, for a — six, seven, eight years, everybody who’s come onto the platform, no matter what they do, no matter whether they’re white supremacist or not, contrary to the Twitter’s, you know, evolved standards, that was not a promise that we never can take your account down. Your Honor, you’re suggesting that a general statement six years ago somehow binds Twitter — when does that stop? When does that — when does that stop? Twitter can’t evolve, as the world changes vastly, and sees that white supremacy is having a major problem on its platform, it can’t act to control that? The lawyer admits that Twitter banned Taylor because of race. He takes it for granted they are justified to ban Whites merely for being White, at least as long as they tack on the semitic buzzterms “racist” or “supremacist”. This is the heart of the issue, despite Taylor’s attempt to avoid it. Critics of Jews are equally concerned with developing an understanding not only of Jewish power and influence, but also of the pathology of Whites that has facilitated Jewish power and influence as well as the current disaster of displacement-level immigration and multiculturalism. The emphasis is on the identification of multiple sources and origins of the current societal malaise, and on evidence-based intellectual and scientific investigation of all aspects of the interactions between Jews and non-Jews in all locations and throughout historical time. This activity can in no way be seen as the seeking of simplistic answers. This, as I said, is the problem. It is an acknowledgement that there is a problem and at the same time it is a misconstrual of the nature and source of the problem. As Joyce’s own description alludes, in the interactions between jews and non-jews in all locations and throughout historical time the sole common element is … the jews. Yet he also take pains to avoid this simple point – to emphasize that he, and other critics of jews seek “multiple sources and origins” which “can in no way be seen as the seeking of simplistic answers”. But the answer is simple. No pathogen, no pathology. Or to put it slightly less simply, the impact of jewish pathologization and manipulation is so enormous that it’s difficult to imagine what problems would remain if they were removed. At any rate, as the earlier portion of Joyce’s article made clear, and as I can attest to myself, an objective critic of jews can dig into as many details and develop as complex an understanding of jews as they like. But from the beginning jews will pathologize them and their effort as “anti-semitism” – as a congenital mental disease which has nothing to do with the jews. My argument is that the simple answer to such single-minded hostility is, first of all, to recognize it as such. Second, to recognize that whatever appeal objectivity has to Whites, however inborn it may be, it is in this case part of the problem. In the face of jewish aggression, Whites have historically capitulated and are now prostrate exactly because we have internalized the fundamental thrust of the jewish critique. Whites have blamed ourselves and our societies for not being tolerant or accomodating enough. The political term for this misguided belief is “liberalism”. The simple answer is to steel ourselves and advise our collective to be less prone to tolerance and accomodation, to resist the urge to blame ourselves and our collective, and instead to recognize manipulative alien collectives, first and foremost the jews, as an endless source of threats and pathology from which we individuals who are aware of the situation have a responsibility to defend ourselves and our collective. I must emphasize now, again, that I credit Joyce with at least connecting his own discussion of “white pathology” to the jews and jewish power. This connection is obvious and simple to make. Yet it is missing from the diagnosis provided by many other pundits who like to use terms like “white pathology”. This is especially glaring for those pundits who insist on using terms like “white suicide” to push the suicide meme, as I discussed in Fear and Genocide. Pundits like the jew Lawrence Auster and the jewhadi Fjordman come immediately to mind. I’m also thinking of pundits like Ricardo Duchesne and Jared Taylor, who more or less pretend the jews don’t exist or are “white”, and in either case the jews don’t play a significant role in anything they have to say about “white pathology” or “white suicide”. Duchesne and Taylor were among the handful of writers Kevin MacDonald asked to address the issue in late 2013, in Recently in The Occidental Quarterly: Special Sections on White Pathology. A prominent feature of the Frankfurt School was the ideology that ethnocentrism among Whites (but not Jews) was a psychopathology. This weapon was taken up by the organized Jewish community which claimed that pro-White and anti-Jewish attitudes were literally public health problems and popularized phrases like “virulent anti-Semitism,” analogizing anti-Jewish attitudes to the spread of a virus. This campaign has been incredibly successful among Whites. Whites who have internalized this pathogen naturally suppress such attitudes, and they do so despite their universality, and despite the reality that ethnic self-interest is eminently rational from an evolutionary perspective. And even despite the fact that many of those promoting this pathogen are proudly ethnocentric themselves. But the campaign has been very effective: No one wants to publicly express attitudes that mark one as a psychiatric case. Given the rationality and the evolutionary imperative of ethnic interests, there is the opposite suggestion — that at least some of the Whites who express such attitudes are suffering from a psychopathology. After all, the great majority of humanity is, to varying degrees, ethnocentric. and proud of it. What’s wrong with Whites? Rev. Marie has dropped out of the White race and has become a crusader against it. Of course, that means a good career and lots of praise from elites in the contemporary environment. But it’s pretty clear that her motivation is far deeper than merely taking advantage of all the opportunities available these days from hating Whites. A genuine race traitor. Noel Ignatiev would be proud. But it isn’t at all clear that Marie’s motivation runs any deeper than the jewish pathogenic factors MacDonald himself describes. Instead it seems, as I previously discussed in the case of Joyce, that MacDonald simply doesn’t wish to accept that it is that simple. Their hatred assumes a surface legitimacy because the hated “whites” are just a “social construct.” It’s not really about killing people, so where’s the beef? The “genocide” of whites is not about homicide or suicide; it’s only about getting white people to stop thinking that they are white. Our interpretation is that Ignatiev’s views are nothing more than ethnic competition. As a leftist Jew, he is part of a long tradition that has opposed white interests and identity — the culture of critique that has become the culture of Western suicide. The culture of critique is a jewish construct, not a White construct. Jews deliberately attempting to induce Whites to stop thinking of themselves as White is genocide, not suicide. This should be obvious to someone who is actually explaining the role played by the jews. So I have to say – never mind what’s wrong with Whites, or what’s wrong with Duchesne and Taylor – what’s wrong with Joyce and MacDonald? Physicians, heal thyselves! When I first discussed “white pathology” (in Pathology and Pathogen), I acknowledged that many Whites are clearly behaving pathologically. My point was that the pathogen, the jews, explains this. Furthermore, jewish psychological influence is visible even in Whites who are conscious of race and the jews, even in those who attempt to explain jewish psychological influence, like Joyce and, as I’ve just described, MacDonald. The most negative response I’ve gotten was, “We know already what is wrong with the Jews … we should now ask ourselves what is wrong with us”. This is precisely the suggestion Joyce and MacDonald have made and that I’ve taken issue with. I consider it a problem that even White men as knowledgable about the jews and jewish power as MacDonald and Joyce are can, for fear of appearing simple-minded, come across instead as overeager to buy into the less plausible idea of a congenital “white pathology”, independent of the jews. An idea which is primarily promoted by jews themselves and others who seem most interested to ignore or at least downplay the role of jews. So far I’ve been reiterating and fleshing out of points and arguments I’ve already made. I’d like to add a new twist now, another way of seeing the relationship between Whites and jews that I think dovetails with this discussion. It also fits my previous suggestion that Whites need to confront the parasitic nature of that relationship, and not shy from taking the White side in it. I first discussed Stockholm Syndrome in The Nature of Jewish Power – Part 3. It was trying to understand and explain the behavior of men like John Derbyshire (see John Derbyshire and The Suicide Thing), who is well aware of jewish power and the fear they induce, but who in spite of that, or rather because of it, minimizes the role of the jews and denounces braver and more honest men than himself who don’t, men like Kevin MacDonald. or capture–bonding, is a psychological phenomenon in which hostages express empathy and sympathy and have positive feelings toward their captors, sometimes to the point of defending them. Included in these traits are the prisoner’s belief (correct or incorrect, it doesn’t matter) that he or she cannot escape, which means that survival must occur within the rules set by the all-powerful captor; and the prisoner’s isolation from people not being held by the captors, which prohibits any outside view of the captors from infringing on the psychological processes that lead to Stockholm syndrome. In the current zeitgeist the White “prisoners”, or hosts, dare not question their jew “captors”, the parasites, who quite literally dictate and diligently enforce the rules of “proper” discourse. This is popularly referred to as political correctness, though the term semitic correctness is more fitting. The crux of capture-bonding is that the “prisoners” don’t see their “captors” as wrong-doers, but out of ignorance or pity come over time to sympathize and make excuses for them instead. Gaslighting or gas-lighting is a form of mental abuse in which information is twisted/spun, selectively omitted to favor the abuser, or false information is presented with the intent of making victims doubt their own memory, perception and sanity. Instances may range simply from the denial by an abuser that previous abusive incidents ever occurred, up to the staging of bizarre events by the abuser with the intention of disorienting the victim. The term owes its origin to the play Gas Light and its film adaptations, after which it was coined popularly. Sociopaths frequently use gaslighting tactics. Sociopaths consistently transgress social mores, break laws, and exploit others, but typically, are also charming and convincing liars who consistently deny wrongdoing. Thus, some who have been victimized by sociopaths may doubt their perceptions. The obvious analogy is that the jews and their psychoanalytic theories of “anti-semitism” are the mental abusers, the sociopathic liars who deny any wrongdoing, and Whites are the victims of their mental abuse, and exhibit “white pathology” as a result of it. Gaslighting – The practice of brainwashing or convincing a mentally healthy individual that they are going insane or that their understanding of reality is mistaken or false. 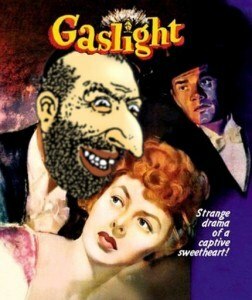 The term “Gaslighting” is based on the 1944 MGM movie “Gaslight”. To cover up his treachery, he tries to persuade Paula that she is going mad, so he can search the attic for the jewels without her interference. He plants missing objects on her person in order to make her believe that she has no recollection of reality. Essentially, it describes forms of manipulation which are designed to make the victim lose their grip on the truth or doubt their perception of reality. Gaslighting can be a terrifying experience. It can quickly put you on the defensive – trying to justify your own actions or behaviors – when you started out by challenging someone else’s questionable behavior. A gaslighting perpetrator’s fabrications may be presented so convincingly and with such conviction you begin to question yourself and your own memories and judgment. In other words, don’t bother arguing with jews or other true-believer anti-Whites. Don’t blame yourself for what the other person is feeling or how they are behaving. Don’t look for ways to change yourself to try to fix another person. As the OOTF 3 C’s mantra says: “You didn’t cause it, you can’t cure it and you can’t control it.” You are only responsible for your own words and actions. In other words, don’t go searching for “white pathology” when the effort jews make to create it is staring you right in the face. If you do, then you are responsible for that. I’ll emphasize again right here that I’m drawing an analogy. It’s not a perfect fit. For one thing, gaslighting ordinarily describes a relationship between two individuals, whereas the analog I’m making is for the relationship between Whites and jews collectively, even though within those collectives there are a broad spectrum of individual motives and attitudes. I do think however that the analogy is useful because it fits the most relevant and important aspect of the relationship between Whites and jews, the relatively conscious and lopsided relationship between White and jew elites. Gaslighting occurs when a person you trust to tell you the truth about reality, is, in fact, bending reality with lies. When this happens consistently over a period of time it causes you to question your sanity. This is important. For whatever reason one participant in the gaslighting relationship trusts the other. They do not expect and cannot accept that the other could lie to them. The other participant, in contrast, is deliberately manipulating and exploiting that trust. Driving the victim insane may not be their main intent, as it is described elsewhere, but can instead be seen as a long-term result of the primary ingredient, the unrequited love, the one-sided abuse and deceit. If you find yourself often questioning your own sanity you need to suspect you are being gaslighted. In the absence of any who will support what you are seeing, hearing, and knowing, please give yourself permission to believe yourself. Gaslighting is a deliberate and evil tactic. So when you’ve determined that someone is doing this to you, it is past time to remove yourself from this person’s sphere of influence. I found a description connecting narcissism, gaslighting and Stockholm Syndrome. Once again, there are some obvious parallels to the relationship between elite Whites and jews – in particular the description of narcissists fits the jews. A victim of NVS can exhibit Stockholm syndrome or cult-like behavior joining up with the aggressor. They will defend and protect the narcissist for fear of not being loved or part of their inner circle. The victim’s self-esteem is so torn down by the Gaslighting and other crazy making behaviors of the Narcissist that it is just easier for them to follow along. They often are so emotionally beaten down they do not realize what is even happening to them, just that they are angry or sad all the time, and feel like they have no persona or sense of self. They will/can show signs of Cognitive Dissonance, which basically means that they know that the situation they are in is no good, but they continue to stay it, using false rational. Yet, they are angry, scared, confused, lost and do not know where to turn to. They fear things that never happened or even exist but because the Narcissist says they did, the Victim is programmed to believe it is so. [calls to mind “RAMPANT ANTI-SEMITISM!” and “THE HOLOCAUST!” -T] Their ability to think clearly has been disrupted and taken over by the Narcissist. There’s much more I could say about this analogy, but as with what I had to say about parasitism, the main point is that it is not only more explanative than some vague “white pathology”, but prescriptive as well. the only way to escape this dangerous dependency upon a psychopath is to remove yourself permanently from his influence. Any contact with him keeps you trapped in his web of manipulation and deceit. In some respects, however, this is a circular proposition. If you have the strength to leave a psychopath and the lucidity to reconsider your relationship with him, then you’re probably not suffering from Stockholm Syndrome. As we recall, psychopaths establish control of their victims BITE by BITE, like emotional vampires. Once again, “BITE” stands for “behavior, information, thoughts and emotions.” Psychopaths attempt to control all aspects of their partners’ experience of reality. To counteract their dangerous influence, you need to BITE back. Give the victim a true perception of reality and real emotional support. Whites need to produce our own media, which offers a true perception of reality and real emotional support. Explain what the jews are doing, and how they are doing it. Counter the lie that they’re just an odd kind of “white” people who are, or could ever be, on the same side. Point out that the jews are gaslighting Whites – that their anti-White narrative about “racism”, “anti-semitism”, “blood libel”, “the holocaust”, and more is manipulative, abusive. Whites shouldn’t put up with this because it obviously isn’t good for Whites. What is race? What are jews? The two questions are connected. Conventional wisdom is divided between two poles: jews are a race, or not a race. The truth is somewhere between. The jews are a group whose nature is racial, more race than not. To understand the jews you must understand race. To understand anything else (especially concerning history or politics) you must understand the jews. Race/racial means heritage, birthright – everything bequeathed by parents to their children, everything inherited by children from their parents. Thus race is both genes and memes, biology and ideology. The latter includes culture, language, arts, traditions, history, legends, myths, and most critically, a consciousness of identity. What is identity? A consciousness of who you are and the group(s) to which you belong. Loyalty to the group, sacrifice for it, hatred and contempt for outsiders, brotherhood within, warlikeness without—all grow together, common products of the same situation. It is sanctified by connection with religion. Men of an others-group are outsiders with whose ancestors the ancestors of the we-group waged war. . . . Each group nourishes its own pride and vanity, boasts itself superior, exalts its own divinities, and looks with contempt on outsiders. Each group thinks its own folkways the only right ones, and if it observes that other groups have other folkways, these excite its scorn. The jews who dominate mass media and education have defined such identity as “hate”, something pathological, but only in Whites. Not in jews. Not in other non-Whites. Jewish Crypsis – An Introduction is the first installment in a long series I produced last year, focused specifically on jewish identity. Crypsis – disguise, secrecy, duality – and the confusion it creates are a very important aspect of that identity. Race or not, race or religion, weak or enduring, adaptive or inflexible are examples of their dual nature. Some describe the jews as an ethnic group, a finer-grained racial concept implying closer genetic relationship, common religion, common language, common culture (myths, heroes, holidays, music, literature). Classification as an ethny is as debatable as race. One problem with seeing the jews as a mere race/ethny is that it imagines them as comparable or similar to other races/ethnies, implying there is some symmetry or congruence. The reality, in comparison to other groups, is incomparability, dissimilarity, asymmetry and incongruence. Why do we do this? Why do we even try to imagine others as like ourselves? This is a White/Aryan personality trait, this tendency toward objectivity and universalism. A less charitable interpretation is that we are unsubtle, unintelligent, gullible even. At any rate, such traits are especially notable in contrast to the jews. But things aren’t so simple. Although Jews today prescribe race denialism for the West, in Israel they are the ultimate race realists and ethno-nationalists. The irony is that “whites” who self-identify as “race realists” tend to be jew-blindists. They espouse a cartoonishly black and white view of race in which jews are “white”. Jared Taylor, for example, is one of the best known “race realists” of this type. He claims jews look white, implying race is simply appearence or skin color. He sees race and jews as two separate kinds of “crankery”. I would hope that most public venues would not allow a Nazi rally in their facilities. The history of the Pioneer Fund and the American Renaissance Foundation shows that there is little difference between the ideals and goals of these organizations and those of racial hate groups that have caused misery throughout the centuries. Modern science now undermines all of their basic premises, and there is no reason to tolerate their hateful, dangerous, ancient, and outdated assertions. If just one racially motivated hate crime is prevented by depriving attendees of the stimulus these conferences provide for some of its more radical and deranged followers, then we have ample reason to close them down. This is the jewish narrative. The inversion of reality is a hallmark of this narrative, typically by transfering blame to Whites for the things jews are responsible for. In this case it is the jews who have caused “misery throughout the centuries” and invoke science to back their fraudulent claims about race. Their actions have stimulated untold “racially motivated hate crimes”, causing the deaths of millions of Whites and promising to cause millions more, leading ultimately to our destruction. Brooks Bayne recently provided a sample of the book The Price of Whiteness: Jews, Race, and American Identity, by Eric L. Goldstein, published by Princeton University Press in 2006. As with any story-telling jew, Goldstein’s story is entirely sympathetic to jews. Even so, and probably because the target audience is jews, Goldstein’s tale is quite blunt and informative, providing a window into the minds of jews, their constant and conscious strategizing, without inverting reality and without all that much of the usual woe-is-me. The Price of Whiteness documents the uneasy place Jews have held in America’s racial culture since the late nineteenth century. The book traces Jews’ often tumultuous encounter with race from the 1870s through World War II, when they became vested as part of America’s white mainstream and abandoned the practice of describing themselves in racial terms. This book lays out the flip on race Occam’s Razor described above, though as we’ll see, the transformation from embracing racial thinking to pathologizing it was quite deliberate and began decades before World War II. The use of “race” as a positive means for self-description among American Jews has not been well documented by historians and, given the contemporary implications of the term, most likely comes as quite a shock to the modern reader. Even more surprising is the fact that this self-description was employed by Schindler, one of the most radical exponents of nineteenth-century Reform Judaism, a movement usually seen by scholars as having distanced itself from strong expressions of Jewish particularism in its attempt to adapt to the American setting. What Schindler’s remark testifies to, however, is the pervasive use of racial language as a means for Jewish self-definition in late-nineteenth-century America, even among those most anxious to take their place in American life. By “race” nineteenth-century Jews meant something different from “ethnicity” in its present usage. Their conception of jewish distinctiveness was one rooted not in cultural particularity but in biology, shared ancestry, and blood. Such overt racial discourse has usually been treated by modern Jewish historians as the province of antisemites, yet racial language also served as an attractive form of self-expression for Jews. American Jews drew comfort from a racial self-definition because it gave them a sense of stability an a time when many familiar markers of Jewish identity were eroding. Despite its strong biological thrust, the racial definition of Jewishness did not impede Jews’ identification with American society and institutions during these years. Because non-Jews of the period generally saw the “Jewish race” in a positive light and defined it as part of the white “family” of races, Jews had few reservations about defining their communal bonds in racial terms. Race, then, fit the needs of Jews to define themselves in a changing social landscape, allowing for emotional security and a degree of communal assertiveness without threatening their standing in the larger white world. Back then jews not only acknowledged the biological reality of race, but proclaimed their own distinctive racial identity. They did so for the same reason they ever do anything – because they saw it as good for the jews. As Goldstein put it, it “fit the needs of jews” “in the larger white world”. If and when the jews change their attitude toward race again, it will be because their need has changed, not their reason. As it turns out I had read this before, I don’t remember exactly when but probably only a few months ago when I was still unnaturally repulsed by talk of White anything. Upon reading it now with a clearer head I see both men make sense, but I’m definitely more in agreement with Taylor. Sailer, as brave and realistic as he is on race, pins his hopes on a worldview, Citizenism, which non-Whites have clearly demonstrated they have no interest in maintaining once they wield any measure of power. Johannesburg, Los Angeles, Detroit – this is what happens when non-Whites gain control – how many more glaring examples of this inconvenient truth do Whites need? Although immigration is today the greatest threat to the survival of Western Civilization on this continent, it is hardly the only threat. Every social problem—poverty, crime, illegitimacy, school failure—has a clear racial dimension that Americans refuse to recognize. There will be no honesty and no solutions until whites clear their heads of cobwebs and start thinking straight again. This will be better for everyone. At the same time, I apologize to no one for putting my group first, just as non-whites do. Whites have a duty to their ancestors and an obligation to their children. Duty does not calculate the chances of success, as Mr. Sailer would have us do. Duty calls us to what is right. My children deserve a country in which they can be proud of their heritage, where their culture is taken for granted, where their history is not treated like a criminal record, where they can be confident their own children will walk in the ways of their ancestors. Indeed, all children deserve this—not just mine. This is why multi-culturalism and multi-racialism are frauds. Racial interests, like family interests, sometimes cannot be reconciled. Every people should have the right to pursue its destiny, free from the unwanted embrace of others. Decades of post-1965 immigration mean it will not be easy to arrange this on our continent. But unless whites awake from their 50-year trance, they will be pushed aside by groups that have never lost sight of their racial interests, and never will. No one else cares whether whites or their civilization survive. If whites do not regain the capacity to defend their interests they condemn themselves to oblivion. The part I’ve emphasized above is my answer to Mencius Moldbug’s criticism that White nationalism is “a romantic and fictitious idealization of social reality” and that it has no hope of succeeding. I’m convinced that multiculturalism is the fictitious idealization. The cure is truth. The more, sooner, the better. Given the relentless and revolutionary assault on their historic national identity, white Australians now face a life-or-death struggle to preserve their homeland. Whether effective resistance to their displacement and dispossession can be mounted is another question. Unlike other racial, ethnic or religious groups well-equipped to practice the politics of identity, white Australians lack a strong, cohesive sense of ethnic solidarity. As a consequence, ordinary Australians favouring a moratorium on non-white immigration cannot count on effective leadership or support from their co-ethnics among political, intellectual and corporate elites. On the contrary, our still predominantly Anglo-Australian rulers are indifferent; some profit from, and others actually take pride in their active collaboration with the Third World colonization of Australia. None of the major parties, indeed, not one member of the Commonwealth Parliament, offers citizens the option of voting to defend and nurture Australia’s Anglo-European identity. The problem, in short, is clear: The Australian nation is bereft of a responsible ruling class. The solution is, in principle, no less obvious: namely, the restoration of a ruling class rooted in the reinvigorated folkways of an authentically Anglo-American civic patriotism, a ruling class re-attached to the history and destiny of its own people. Only time will tell whether and how any such constitutional reformation could take place. Burned out husks of what were once beautiful homes and businesses are emblematic of our ruling class’ treason. 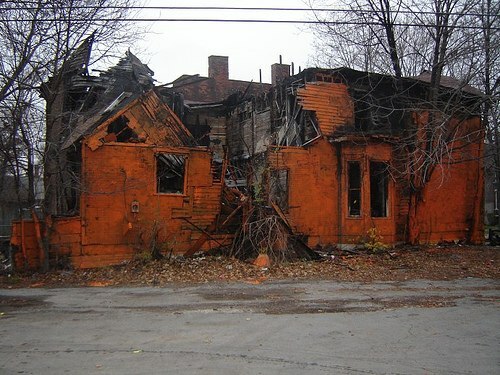 The dilapidation isn’t random. The more urgently they import savages to “do the jobs Americans just won’t do”, the more quickly civilization dissolves. Or haven’t you noticed yet?